UPDATE: Not all the eggs were house sparrow eggs! 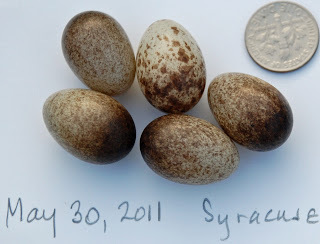 A few weeks ago, we collected eggs from the house sparrow nest. We do this routinely--three times so far this summer, and they're starting on another batch already. As I mentioned before, we don't enjoy doing this, but this non-native species actively harms our native songbirds, so we feel we have a responsibility to try to minimize their population. We had sent a photo in to Cornell since they are researching variability in eggs, and the house sparrows are a perfect candidate for this research. I was surprised that there was so much variability and now I know why. Cornell was going to use my photo in the next issue of BirdScope, but they just emailed me that they won't be able to use it. On closer inspection, they realized that the egg in the middle of the top row isn't a house sparrow egg, it's a cowbird egg! It's a little bigger and a little splotchier. I always hate to see the cowbirds around. Even though they're native, they didn't evolve in our area and so our songbirds have no defenses against them. As with the house sparrows, it's human intervention that has caused the problem. In the case of cowbirds, the herds of bison they used to travel with no longer roam the prairies. When they moved east, they didn't live in unlogged forested areas ... but now there are so many roads in forests that cowbirds easily find songbird nests to parasitize. Birds that evolved with cowbirds have strategies for dealing with them. Some toss them out, some build on a new nest layer on top of them, and so on. Songbirds that didn't evolve with cowbirds don't have these defenses and end up raising the cowbird babies instead of their own. Some experts say this might lead some songbirds, already challenged, to extinction. We have baby robins and baby wrens active in the yard. The robins are from the nest in our arborvitae next to the driveway, and the wrens are from our nest box along the back fence. The robins are pretty quiet. They sit there just waiting for the parents to come. 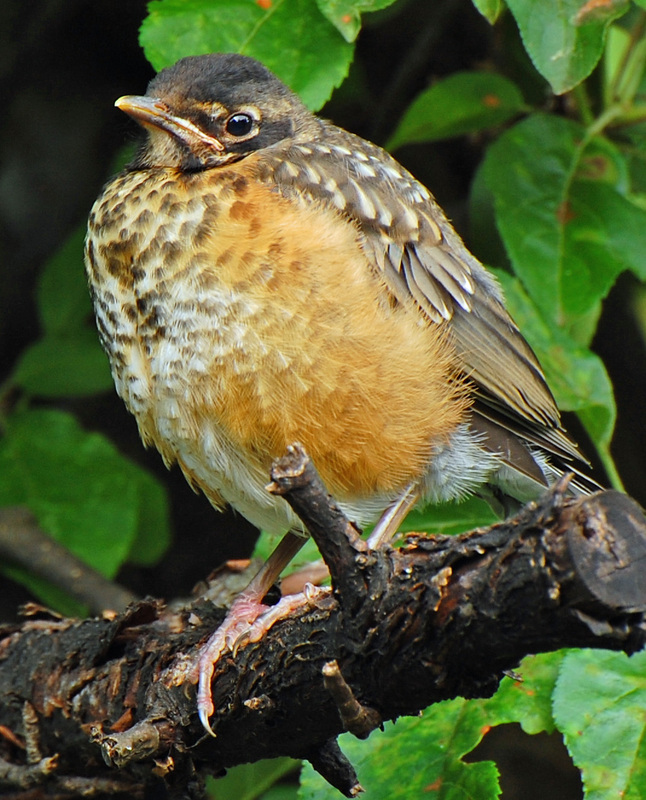 The adult robins also seem to be pretty quiet. All in all, this is the way I'd do it if I were a bird. The wrens, on the other hand, are all full of chatterings. The little group travels among the trees and shrubs in the front and side yards, announcing their presence. This must work for them since their populations in the East and Central parts of the US are going up according to the Breeding Bird Survey, although the population according to the Christmas Bird Count is going down. I got these figures from the first edition of the Stokes Field Guide to Birds (my favorite field guide). The guide, though, is 15 years old, so the situation might be different now as it is with so many birds. Birds are in trouble! By the way, this photo was captured by having to patiently sit for quite a while (sitting on a quickly-snatched compost bucket) when I spotted this baby. Getting good bird photos requires much more patience than I naturally have, but it's worth it to try to capture a good image of these appealing creatures. Our first monarch visited our yard yesterday (June 16). This is about a week before we've ever seen them here before. Central New York seems to be one of the last places they visit, since even people in Canada have already had them for a while. I was surprised to see that the butterfly apparently visited only the common milkweed on the edge of my property and then must have gone in the other direction. I found only six eggs, which I brought inside. It completely missed all the other milkweed I have throughout my yard. 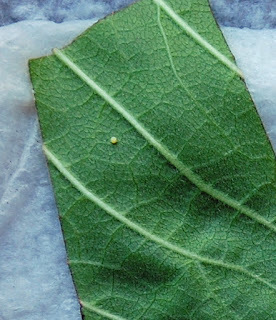 I put the eggs on a wet paper towel, and I'll be watching for the caterpillars to emerge in a few days. 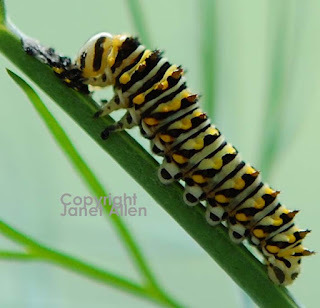 I'm considering some different methods of raising the caterpillars this year since I'm concerned about the Oe parasite. Our black swallowtail caterpillar is growing quickly. In this photo, it's eating some of the dill I have in the aquarium, but this pose is unusual. Most of the time it looks like it's just sitting there, not eating at all. 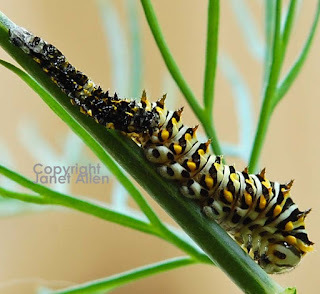 This is typical of the black swallowtails we've had. They must be eating somehow because they're growing and are very healthy. 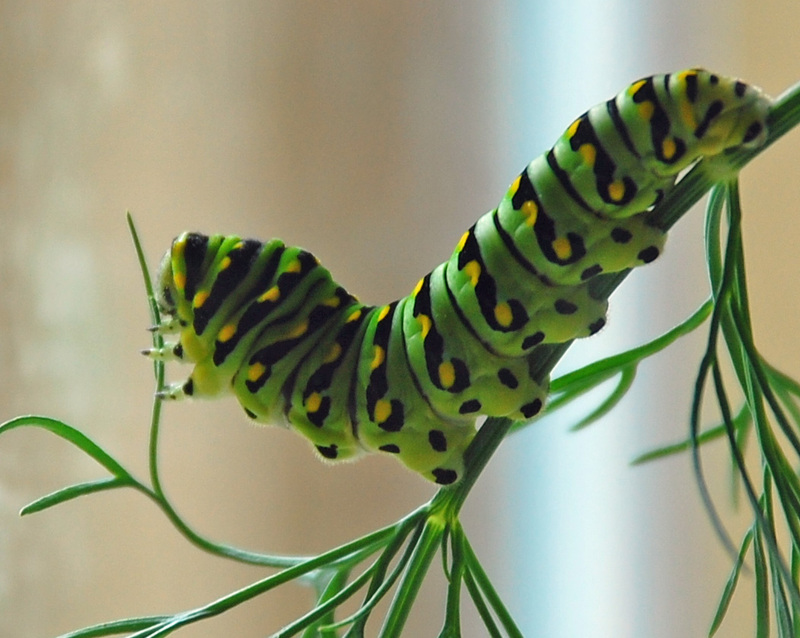 They're not at all like the monarch caterpillars, though, which actively chomp on milkweed so quickly you can see it disappear. The same result comes from both eating patterns, though: beautiful butterflies! 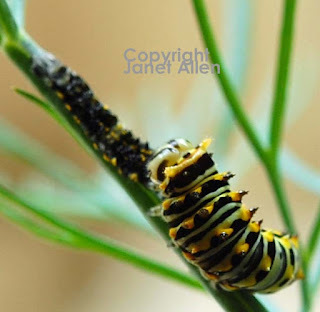 A few days ago we found a very small black swallowtail caterpillar on some of our dill. We brought it inside to raise it. This morning I noticed that it was shedding its old skin. Then it turned around to begin to eat its old skin. Although it might seem unappealing, it's a great example of how other creatures (other than humans) don't let anything go to waste. Nature can create wonderful things in abundance without the pollution we create. Note: Biomimicry is a fascinating field of design/engineering. It learns from nature to create new products and practices. As I was about to get some dirt from our out-of-the-way dirt pile (which we had collected from various places to use as needed), I discovered bishop's weed (aka goutweed) growing there! It was already flowering. 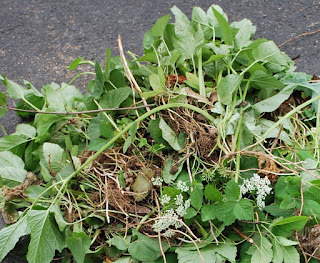 Having written an article about bishop's weed for the Wild Ones Journal, I knew it was something to be feared. 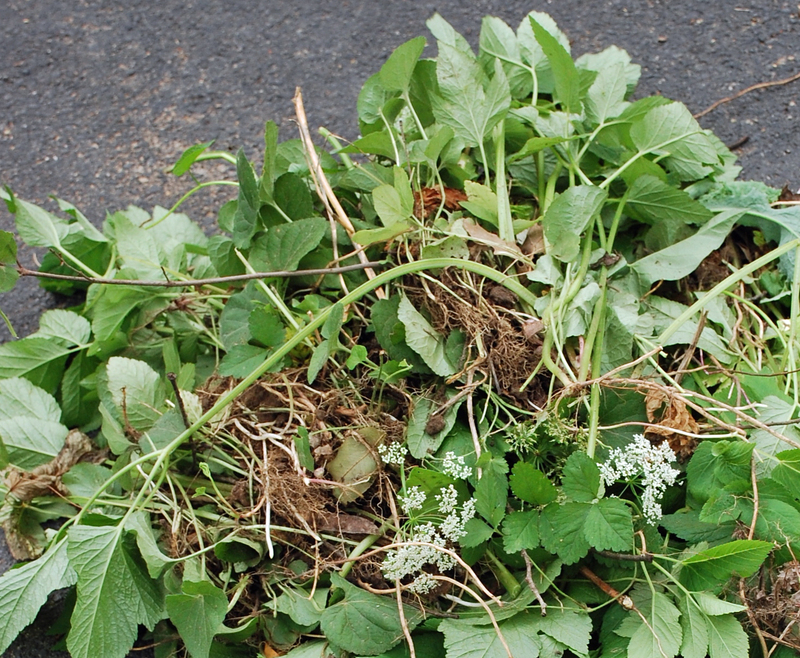 In my research for the article, I had read of people who literally scooped up the top layer of soil in their yards, had it carted away, and replaced it with new soil. The roots go deep, and even the smallest bit of root can again become a plant. It's tenacious. I have visions of it taking over our whole yard. We'll have to monitor this area for the next few years to make sure we eradicate it. So far, we've pulled out what we could and have it in a black garbage bag inside a garbage can. We'll let it die for a while, then put it in the garbage. I hope that will keep it from spreading either in our yard or elsewhere. It's upsetting to know that this plant is still being sold. It's a public menace! I enjoy taking photos of the little things in my yard. I always have to remind myself to sometimes take pictures of the bigger picture, too, because I'm inclined to "think small." It's so fascinating to look at the world from a smaller perspective. 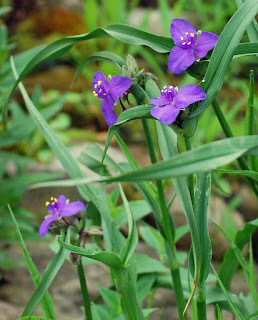 This photo shows one of my favorite plants--spiderwort (Tradescantia). This shows the size of the flowers and the plant. Spiderwort is a good nectar plant and draws lots of bees, especially bumblebees. I really enjoy bumblebees, but I also noticed some little bees getting nectar, too. I think they're flower flies of some kind. You can see from the second photo that in comparison to the flower, this is quite a small bee. The third photo shows this little bee closer up. It's quite intriguing, but it would be easy to miss it in the larger landscape. 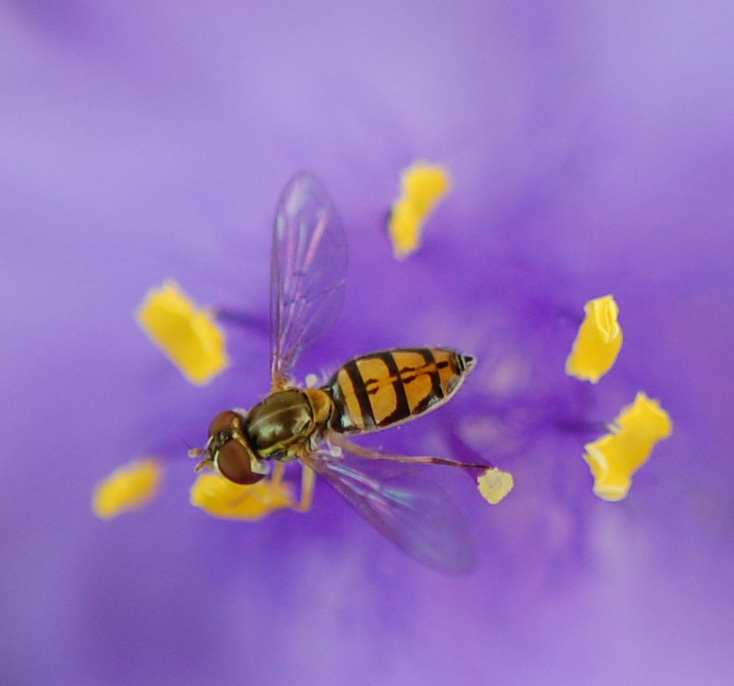 It's a little gem of an insect and rivals many larger creatures in beauty. And yet how many people ever really see it? 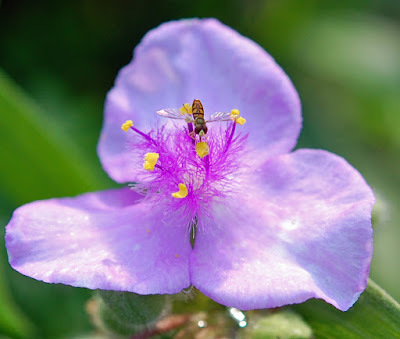 Someone could probably traverse my smallish urban/suburban yard in a few minutes and think they had seen it all, but there are billions of little things to see when I "think small." A digital camera is a very useful aid in exploring this world. It allows me to see things closer up when I'm looking at the digital image back at the computer than I could ever see in real life. Computers and digital cameras are two things whose loss I would mourn. I know that the world (especially those of us living in the developed world) will have to create a more sustainable lifestyle. The challenge will be to keep those things (for me the digital camera and computer/internet) that truly enhance our lives and shed all the other stuff that are merely conveniences or trinkets. I know many people do not agree with people choosing to favor some species over others. In their view, house sparrows have just as much of a right to be here as native birds. I agree that house sparrows themselves are not at fault -- we humans brought them to this country for our own purposes. However, I believe that we need to take responsibility to correct this situation. House sparrows are a disaster for native birds, and every house sparrow we have represents many native birds whose nests they have overtaken and whose young they have killed. To do our part, we routinely remove house sparrow eggs from our nest boxes. As a non-native species, house sparrows are not legally protected as are native birds. We'd never interfere with native bird nests! And, of course, if we lived in the UK, these would be native birds, and we'd not interfere with them in that location. It's not about liking or not liking house sparrows (actually a weaver finch). I'm delighted to know that finally this practice can serve an even greater purpose. 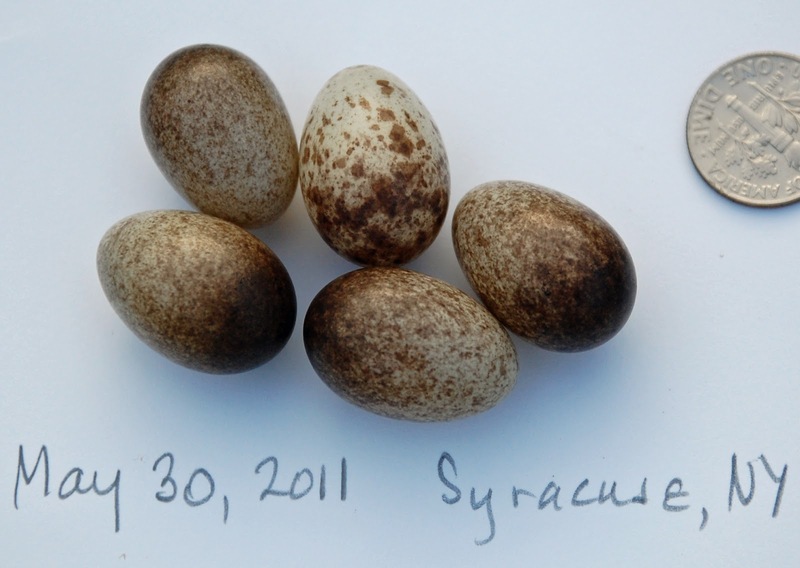 Cornell Lab of Ornithology's researchers are studying the variations among house sparrow eggs to research various ecological questions without disturbing native birds. As they indicate, "eggshell coloration and pattern may vary with available calcium, sunlight patterns, or habitat quality, and are expected to differ seasonally and geographically as well." I submitted (a higher resolution version of) this photo of the eggs from a recent house sparrow clutch for their use. It is surprising to see so much variation in color and patterns. Although I'm not happy removing any bird's eggs, I'm confident that this is the ethical course of action that will help our native birds and promote a healthy ecosystem.